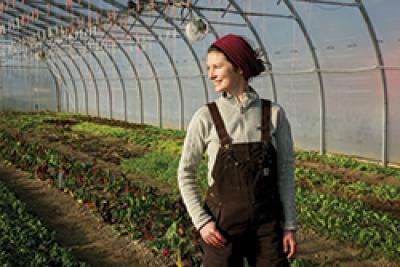 In January, Lydia Ryall (BSc ’06) was named the 2014 British Columbia and Yukon Outstanding Young Farmer. The honour recognizes farmers aged 40 and under who derive at least two-thirds of their income from farming. Nominees are evaluated on, among many things, their conservation activities, financial and management practices, production history and contributions to the community. As a regional winner, Ryall, 29, traveled to Quebec City in Fall 2014 to compete for the title of Canada’s Outstanding Young Farmer. Ryall’s passion for farming took root when she was just a child. A third-generation farmer whose parents owned a greenhouse operation, Ryall regularly heard about the agricultural industry during dinner-table conversations. Today, she owns and operates Cropthorne Farm, a four-hectare, certified organic farm on Westham Island, close to Ladner, B.C. Working alongside older sister Rachel, Ryall also employs two full-time, year-round employees and three full-time seasonal employees. Together, they grow more than 50 types of vegetables, everything from arugula to zucchini. In addition, eggs are provided by the farm’s 100 free-range hens. In the five years since Ryall started Cropthorne, she has become known for her commitment to conservation, farmland preservation and alternative pest-management practices. For example, to protect her plants and prevent insect damage, Ryall uses sprays that are organically approved and a lightweight fabric called a floating row cover. Using the tagline “Real. Good. Honest. Food.” Cropthorne’s products are sold at local farmers’ markets, to nearby restaurants and through a seasonal farm stand. Cropthorne also runs its own 90-member Community Supported Agriculture Box program. But just because Ryall uses social media to connect with customers and directly sells to local buyers doesn’t mean her business concerns are any different from those who run larger, more conventional operations. Ryall credits the University of Lethbridge for teaching her about the complexities of modern farming. The only liberal arts university in Canada to offer an Agricultural Studies program, the U of L helps aspiring agriculturalists gain an in-depth understanding of contemporary farming and ranching activities through hands-on learning and courses in such diverse subject areas as biological sciences, economics and geography. “The U of L taught me to become a lifelong learner and how to network within my industry,” says Ryall, who frequently attends agricultural conferences to stay on top of new developments in her field. She is also director of the Delta Farmers’ Institute, is involved with the Lower Mainland Horticulture Improvement Association and serves on a local agricultural advisory committee. This story appears in the Spring 2014 edition of SAM. For a look at the full magazine in a flipbook format, follow this link.